For Brown Basmati Rice: Put a small dollop of coconut oil in the bottom of a pan on medium heat. 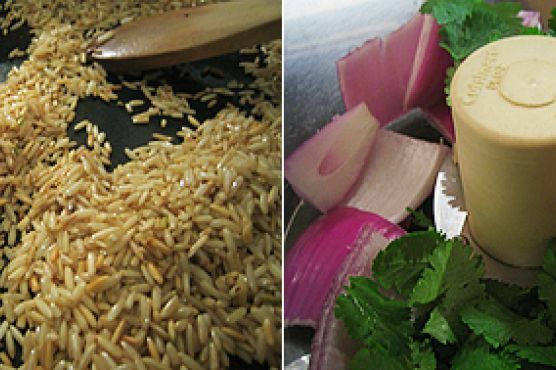 Add your Basmati rice and lightly toast the grains for about 5-7 minutes. Mixed Vegetable Curry: Make a curry paste by mixing the bunch of cilantro leaves (stalks removed), red onion, ginger and garlic in your food processor.Now, make a cashew cream by blending the cashews and pure water together until completely smooth. Place a small dollop of coconut oil in a pan over medium-high heat. Transfer your curry paste to this pan and brown the paste.Once golden-browned, add remaining curry ingredients, including your cashew cream, and stir well. Cook over medium heat for about 10 minutes. Remove sweet potato from oven and chop into small cubes. Add potato to the curry and cook for another 7-10 minutes.